Because sometimes you put together ingredients that you like and realize your marinade is really margaritas. Carne asada is really wonderful, and one of the healthier options of Tex-Mex cuisine. It’s a little different everywhere you go. Sometimes it’s marinated, sometimes it isn’t. 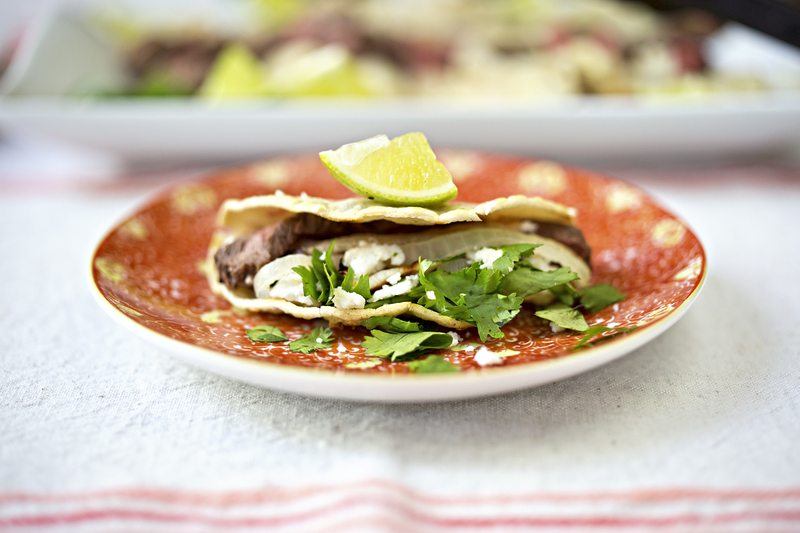 Sometimes it’s in taco form, sometimes it’s just a steak on your plate with fine fixin’s. Either way, it literally translates as “grilled meat.” Sounds easy enough, yeah? As we were having guests, I thought it would be easiest to take the taco route, and do it up with a bunch of satuéed onions so everybody could kind make their own. (Thank you Susan and Kerry for joining us and being my guinea pigs!) To really snazz up my lime-tastic marinade I thought I would throw in a little tequila… which turned into a lot of tequila. Hey, a little bit (a lot) of tequila never hurt anyone, right? 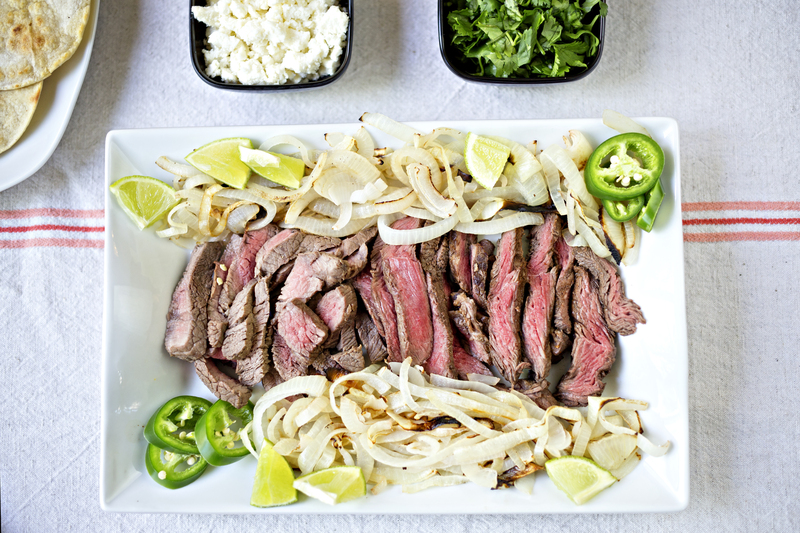 Carne asada is usually made with skirt steak because it’s thin yet reasonably tender. I took elk round steaks and tenderized them thin. Worked like a charm. Normally I would have grilled the meat and suggest you do the same, but seeing as how hell had come to visit Dallas that day and it was something like 109 degrees outside, I tried it two indoor ways: broiling and pan searing. The broiling worked okay, in the sense that yes it cooked it. However, no crust formed on the meat, no doubt because the really juicy marinade just steamed it. I suggest pan searing it – if your steaks are a little thicker you want to cook it on medium high heat for about 2-3 minutes per side for medium rare. For thinner steaks, cook a little longer lower heat, I’d say medium heat for about 4-5 minutes a side. If it’s not melt-your-face-off hot outside then grilling is always best. For some reason this image makes me think of cookie monster, even though this recipe doesn’t include cookies or monsters. After tenderizing your meat, combine all the marinade ingredients and soak the meat in them for at least 30 minutes, or up to a day. Once finished, pour out the marinade and pat the meat dry. Heat a skillet to medium high heat and spray with pan spray. Sear, cooking on both sides, to your desired doneness (3 minutes per side for rare). If you prefer your meat to be more done, turn the heat down a notch so the outside doesn't burn. Meat can also be grilled or broiled (on broiling, 3 minutes per side for medium). Take meat off the heat, remove to a cutting board and let rest for five minutes. Deglaze the pan with water, beer, tequila, or anything you happen to be drinking that isn't red wine. Add the onions and cook until soft and starting to brown (about 10 minutes). Once the meat has rested, slice thinly against the grain. Serve on a platter with the onions, and serve with tortillas, avocado, cilantro, and/or any other fixin's you like! 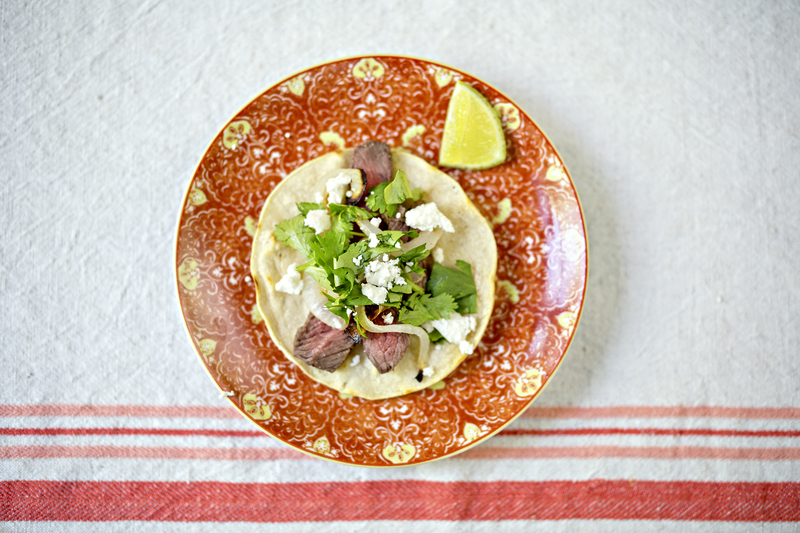 Non game substitution: Use beef skirt steak!